Above is a better shot of the fabric! How cute is that?!! 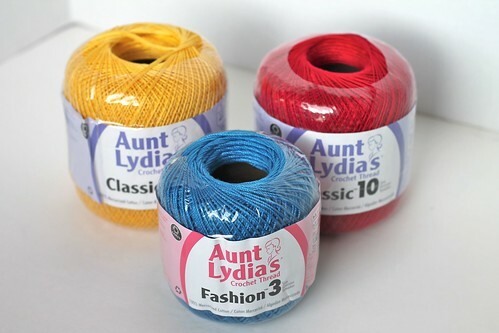 And that thread?!! The colors?!! It's like she knows me. Too well. As if she hadn't spoiled me enough, she also gave me some great crochet patterns! Thank you so much Sarah, I love it all!! Thoughtful handmade gifts are the best! The little adorable owl is already keeping my Bunny Mummy owl company, and I've already started a doily with that beautiful bright yellow thread!! What fantastic presents to receive! 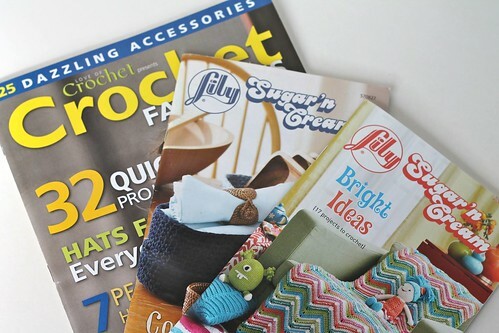 I love those colourful threads and love the excitement of new pattern books! 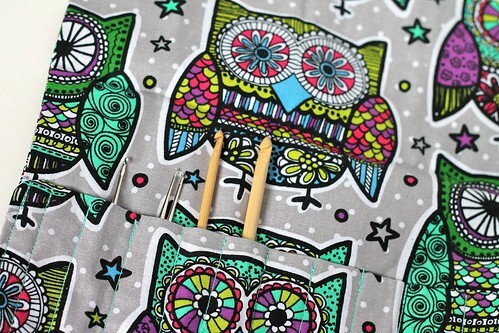 The owls are cute and so useful to have something to put the crochet hooks in! How lovely to be spoilt from time to time! I love belated birthday surprises! Yeah, I feel pretty lucky!! I'll pass on the compliment to my friend! !